Campania's whites are not as well known as they should be, apart from Greco di Tufo and Fiano di Avellino. The variety Coda di Volpe can be excellent. 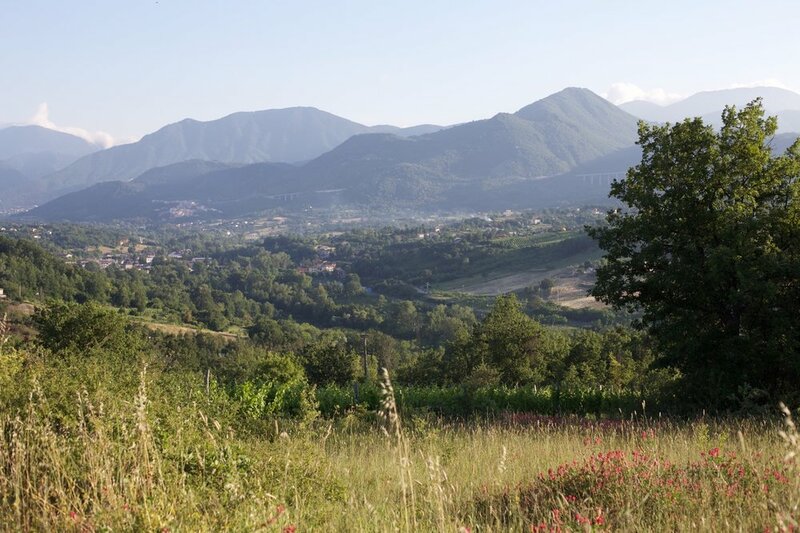 This one is very unusual: the 80-90 year old vines are interplanted with Aglianico in the Taurasi vineyards; after picking, the fruit is destemmed, crushed and left for about 12 hours on the skins, then pressed in the same basket press they use for the reds. After fermentation the wine is aged for about 2 1/2 years on the fine lees in a stainless steel tank, then filtered and bottled. Beautiful intense pale yellow color; aroma of herbs, white peach, a hint of citrus, and wet stones; long, fresh, and slightly phenolic on the palate, delicious to drink when released but I'd be surprised if this didn't age well, it has the structure and the intensity of flavor. The winemaking is kind of rustic but the flavors are anything but. 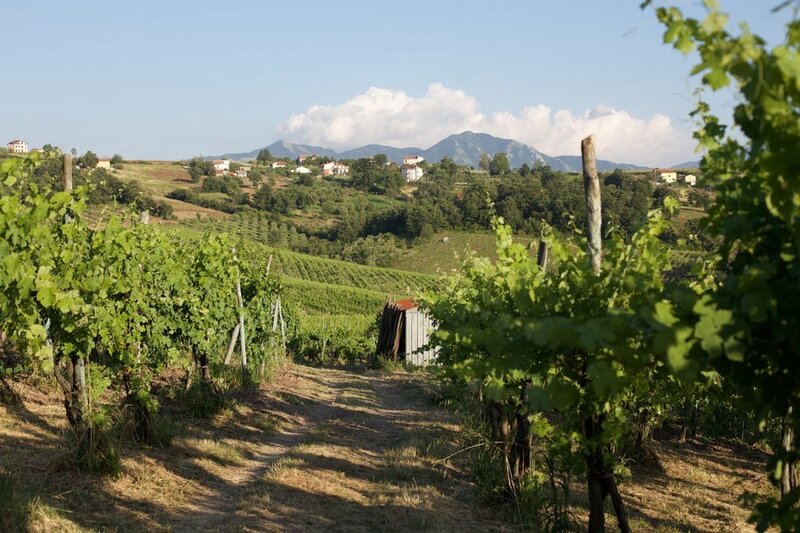 Three quarters of the Aglianico vineyards were planted in 1930, and are trained in a kind of pergola called 'raggiera', the remainder were planted in 1980. The vines are massal selection, not clones. The soil is a kind of clay, of volcanic origin. The grape is of course Aglianico; the form of Aglianico found in Castelfranci looks different from that of Taurasi, the bunches here are longer and looser, like a horse's tail ('coda di cavallo'). The altitude ranges from 470-500 meters (about 1,600 feet) above sea level, which is high for red wine grapes. The grapes are picked extremely late, in late October or early November, de-stemmed and crushed, then macerated at low temperature for three days before fermentation starts (using indigenous yeast). Maceration is for about 3-4 weeks, depending on the vintage, then the wine is aged in used barriques (the youngest is at least 5 years old) for 12 months, then large barrels (2,000 liter) for another 12 months. Perillo started buying big barrels in 2008. Michele's Taurasi shows the classic Taurasi flavors, red and black fruit, cedar/sandalwood/tobacco aromas and flavors, a savory beefy character, a fair amount of fine tannin (the comparison with Barolo in flavors, structure and ageworthiness is inevitable); what differentiates this from other Taurasi I've tasted is the exuberant fresh acidity, due presumably to the high altitude of the vineyards. The winemaking for the Riserva is identical to that of the regular Taurasi, it is merely a selection of the best lots. 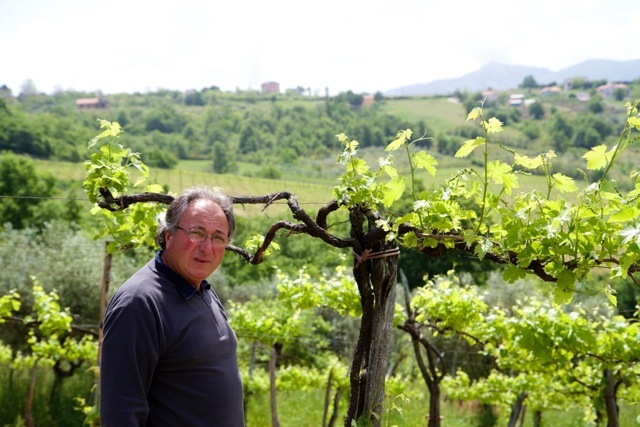 Vintages: we are lucky, Perillo still has some back-log of older vintages in his cellar, and we are starting with vintages that are ten years old. This was true orignally of Contrade di Taurasi, and I imagine that as Perillo's reputation grows, that will change. Take advantage!